Walter Simonson began his comics career back in the early 1970s at DC first on a number of their war books but it was the Manhunter strip that ran in DC’s Detective Comics in 1973-1974 that brought him to people’s attention. Written by DC editor Archie Goodwin, Manhunter helped to resurrect the fortunes of DC’s flagship book (the company is named after the series). Manhunter led to a series of different projects including adapting Ridley Scott’s Alien for Marvel and drawing Marvel’s Rampaging Hulk magazine. Simonson also was one of the regular pencillers on Marvel’s Star Wars comic. But it was his long run on Marvel’s Mighty Thor which began with #337 in 1983 that took his fame to another level. In a run that saw Thor turned into a frog, the introduction of alien warrior Beta Ray Bill and many more memorable tales, Simonson displayed his love and empathy for the character and created a comic that people still talk about decades later. “From when I was a child. I liked mythology in general. I think the first story I probably came across was the story of Beowulf in fourth, fifth or sixth grade. There was some book in the school that had an illustrated version and I remember the illustration. I’ve no idea what the book was. It was like a kid’s literature book with lots of stories, illustrated and one of them was a short version of Beowulf, which was fantastic. It also turned out my parents had a couple of books in the house that actually dated from about 1893 or 1894. They were matched volumes and one was the Greek and Roman myths and the other was the Norse myths and I read both of them. I like all of them but the Norse myths when you’re a kid really connect with you,” he explained. After Thor, Simonson started a long run on the company’s X-Men book X-Factor, written by his wife and fellow guest of Portsmouth, Louise Simonson. Then he moved onto Marvel’s Fantastic Four series for a little while. After his work on Elric, he returned to Marvel to work on The Avengers and The Indestructible Hulk. In 2012, he went back to DC who published The Judas Coin, a graphic novel he wrote and drew which featured a range of DC characters over the centuries, connected by one coin. Simonson also went back to one of his earliest creations, Star Slammers, for a new miniseries which was published by IDW in 2014. Since the summer of 2014, Simonson has devoted his time and energy to writing and drawing Ragnarok, a norse mythological series published by IDW. IDW has also been republishing much of his older work like his Thor run and Manhunter as part of their Artist’s Editions line. 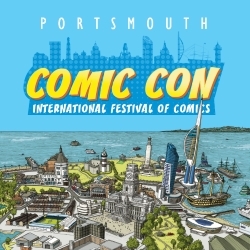 Portsmouth is the first time he has attended a UK comic convention since 2008.